WE HAVE WON THE WIND TURBINE WAR! APPEAL DISMISSED - PLANNING REFUSED! ASWAR is overjoyed on behalf of the local community that the Secretary of State Greg Clark (a member of the Cabinet), has announced that the McAlpine/RES 'Appeal' (and supported - without credibility - by Rugby Council planners) that was in favour of subsidised wind turbines in the Upper Swift Valley, is dismissed and planning permission finally refused. ASWAR Congratulates the Churchover/Cotesbach community. It is fantastic how the community came together to fight for six years and win against two strong armies. Firstly, we have defeated the wind turbine subsidy speculators and can now put them behind us, leaving them to cry over how their scam has not worked. Secondly, it is the Rugby Council planners’ actions that Rugbeians should know about for the future and put in place training and proceedures to not allow it to happen again. The planners tried to circumvent the democratic process. The electorate correctly hold their elected Councillors accountable for making decisions on planning policy. But the planners ignored the Councillors and decided by themselves to change the Council wind turbine policy from ‘refusal’ to ‘support’ without allowing the councillors to have a say. On top of that they wasted some £20,000 of tax-payer money to hire an expensive lawyer to aggressively attack community representatives at the public Inquiry. ASWAR welcomes and is encouraged that the government Inspector and Secretary of State, have listened to the people and re-established some democratic trust in the planning system. The planners, professionals who got it wrong, and have now publicly apologised to the community. We thank them for that. Yes, the community is proud to have fought our 'Nimby' battle but we have always also publicised the arguments for the wider national interests and let us all hope it will not be long before the 2008 Climate Change Act is suspended and a sensible national energy policy based on ‘Energy security and affordability for all’ is implemented and important jobs, like in the high energy intensive steel industry, can be saved. A third victorious battle in the five year war to defend Churchover/Cotesbach has been won. Rugby planners have been forced to agree with ASWAR and deem the re-application for four wind turbines invalid. However, this still leaves us with the big, expensive battle - the McAlpine/RES Appeal against the original local rejection with an Inquiry that is planned to start on Wednesday 2nd September in front of a government inspector. He will then report his findings to the Secretary of State for Communities and Local Government, Greg Clark, who will finally decide whether what was put in the Tory Manifesto and realised in subsequent planning policy changes, will be implemented or whether the community will be put to the wind turbine dogs. Though our arguments across a range of local planning issues are strong, what is defining and crucial, is that on June 18th 2015 Greg Clark announced that on-shore windfarms should not be given permission if the local community was against them. By any measurement this local community is against! In the meantime an enormous amount of time has been put into writing ASWAR’s and Churchover Parish Council’s Proofs of Evidence papers that have been submitted to the Inspector and will be posted on this web site some time after August 6th. Churchover Parish Council has now submitted its detailed and compelling objection to the latest windfarm application which can be read here. Historic England (formerly English Heritage) have repeated their strong objection to this application which can be read here. Another detailed objection from a Churchover resident is also worth reading here. The community across the Revel District goes into its fifth year under threat from now a new application to build four huge wind turbines that if not fought could be given permission this year to generate millions in subsidy for the next 25 years for speculator McAlpine/RES taken from everybody’s electricity bills, thereby increasing fuel poverty, losing jobs in energy-intensive manufacturing and through the wind’s intermittency helping put at risk the National Grid’s efficient ability to keep the lights on. However, the winning post is in sight, with legislation promised to stop subsidies for the on-shore wind turbine scam from next year announced by new Secretary of State Amber Rudd, after which it will become unprofitable to build them. Please remember to mention your name and address, and the reference number R15/0908, in your objections. The key planning objection is the paragraph below. The setting of the heritage church in the conservation village, that has dominated the beautiful meandering Upper Swift Valley for 1,000 years, will be industrialised and ruined. Go to the How To Help section of this web site for more details on how you can help. Are NATS putting Aviation Safety at risk for commercial gain? ASWAR has recently discovered that legal representatives acting on behalf of McAlpine/RES are stating publicly that, as a result of "detailed discussions" between McAlpine/RES and NATS, there is, to quote them directly, "a real possibility that NATS will be in a position to withdraw its objection to the proposal" in advance of the September 2015 Inquiry. Is there any truth to the statement made by McAlpine/RES, and has NATS authorised McAlpine/RES to announce this information? If NATS is close to withdrawing its objection to this application, please can you provide full details of how this is possible in light of the fact that none of the accepted mitigation schemes can be applied to this development and your own extensive research into understanding the AGA comms impact along with updated guidelines is not scheduled to be completed until March 2016? Again if NATS is close to withdrawing its objection, what evidence does NATS have to be 100% certain that this particular development would never have any impact on AGA comms from the Pailton radio station and hence put Aviation Safety at risk? Has McAlpine/RES given or promised to give NATS any funding? Can you please provide us a full schedule of 1) the people or organisations who have provided funds to NATS (and how much) to help pay for your research into this area and 2) the amounts of money you have already and are planning to invest in this area. Where Aviation Safety is concerned, your previous safeguarding stance and record has rightly in our opinion been to take no risks when the poorly understood issue of AGA comms interference from wind turbines is concerned. Your own research and that of other independent parties has produced evidence that there can be an impact from wind turbines on AGA comms. Until there is a much greater understanding of this issue, backed by an agreed set of updated safeguarding guidelines, developed in line with already announced, (and peer-reviewed) research, should not this be the position that must be maintained by NATS to continue to guarantee the safety of aviation in the UK? Solar Park - Well done with your Objections! The proposed 60-acre Solar Park that has been called ‘an abomination’ by our local Conservative Councillor and MP, has generated many objections and will be delayed in going to the planning committee, which will not now be until July at the earliest. quoting R13/1401 and saying you object. He has said he is still open to receiving objections. Solar Parks on good agricultural ground is against Government policy since May 2014. (The two farmers who have farmed this land for over 20 years and the land adjacent, say it has high quality, excellent soil on ideal flat land for grazing or crops. The widow of the previous farm manager quotes the late Fred Green, an important local farmer, who owned over 2,000 acres around the district, that he always said this was the best and most versatile land he owned). It will be an eyesore from every direction, looking like a Prison Camp, with its rows of reflective solar arrays, security fencing and lighting with cameras on high gantries. These speculators should build on brownfield sites and factory and warehouse roofs before using good land and destroying our environment and landscape. There are lots of warehouses around here. The Village has voted 85% against, at a well-attended meeting of 60 in a village of 100 dwellings, where the Chairman of a Solar National Trade Body spoke in favour, with the local Conservative MP and a UKIP MEP against. Government Ministers have stressed that large Solar Parks need local support and involvement, before planners can give a go-ahead. It will industrialise the ‘vital green lung’ between sprawling Rugby warehouses south of the M6 and Lutterworth with its appendage of Magna Park. 25 years is not a ‘temporary’ inconvenience in the life of a village, whose property values will be reduced without compensation. Good agricultural land should not be taken out of food production, by a regressive scam that moves our money into greedy landowner’s pockets, sudsidy speculators and overseas manufacturers, while increasing fuel poverty among the poorer members of the community. It will be an intrusion on the conservation village and heritage assets and historic landscape. Subsidised Solar Parks create small amounts of expensive, intermittent energy that requires inefficiently run ‘spinning’ fossil-fuelled back-up, all of which increases costly electricity bills and reduces British industry competitiveness. The independent OBR (Office of Budget Responsibility) commenting on the recent Government’s Autumn Statement, predicted: Green levies on household energy bills will triple over the next five years to £10 billion as the number of wind turbines and solar parks already permitted are built. NHS go weep! Thank you, your help is much appreciated by a community under siege now for five years. * the rules say that the planning officer has to present any comments received up to the Friday before the Planning Committee meeting so they are taken into account by Councillors in their determination of the application). “Air Traffic Safety at risk, as Churchover raises funds to defend community at Called-In Appeal. We do not agree that a tiny amount of costly, intermittent energy from wind turbines of the subsidy speculator McAlpine/RES, is more important than Air Traffic Safety, nor the industrialising of an historic conservation village in a vital green lung between Rugby and Lutterworth. We are grateful to Mark Pawsey, the local Conservative MP, for his effective lobbying on behalf of the community that has now been under threat for five years, which has persuaded Secretary of State Eric Pickles to immediately Call-In the appeal. If the community’s excellent argument is well presented at the Inspector’s Appeal, the Call-In makes it much more likely that the decision will go against the turbines. Churchover Parish Council and ASWAR have now launched an appeal to raise significant funds to hire a top lawyer to lead their case. Will NATS give-in to political and commercial pressure, cut corners in Air Traffic Safety and withdraw their objection when they come under attack by McAlpine/RES concerning their technical competence at the appeal? Note 2: The intermittency of energy from wind turbines requires the National Grid to have fossil-fuelled back-up on inefficient ‘spinning’ reserve, for when there is lack of or too much wind, in order to balance generation and keep the lights-on. The more turbines and solar parks that are built the more out-of-kilter will the balance become. Energy Secretary Ed Davey it is reported will announce this week more costly emergency contingences for the National Grid to pay large companies and hotels to 1) generate their own power or 2) turn down their refrigerators. Ordinary households it seems will have to pay for these freebies given away when the wind does not blow or the sun shine. 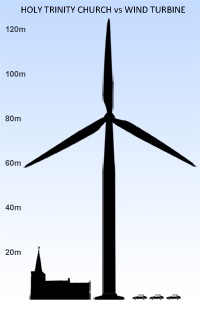 Note 3: Average capacity efficiency of on-shore, combined with windy off-shore, turbines is around 25%. Midlands turbines operate at less than this and nowhere near the 32.9% figure claimed by McAlpine/RES, who are not independent as they say but a wholly owned subsidiary of the enormous McAlpine building group, who were accused by the BBC's Panorama of setting-up the illegal blacklist in the building trade. One large gas power station like the one in Pembrokeshire creates about the same energy as all the UK wind turbines combined and takes up some 500 acres while the turbines cover 250,000 acres and Solar parks 130,000 acres! Note 6: A report commissioned by accountancy firm KPMG came to the conclusion that if the government dropped its wind turbine subsidy policy it would save the nation £34 Billion which means £550 saved for every person. NHS go weep! Note 10: Every political party is talking about making a fairer society. How can it be fair for already rich land owners and renewable energy companies to be paid twice the value of what they produce (gas is half the cost of onshore wind) and expect the whole community, including the poor and vulnerable, to subsidise them? Local Conservative MP Mark Pawsey, and UKIP National Spokesman on Energy, Roger Helmer MEP, combined together in speaking in the defence of the small Churchover community, under siege for the third time in five years, now by a Solar Park. The community meeting was also spoken to by the chairman of a national solar trade body but he was unable to swing the vote of 45 against, 7 in favour (including 4 financially involved with solar parks) and a handful of abstentions. Lorne Smith, the ASWAR coordinator of the successful and well attended meeting in the beautiful Holy Trinity church (an oil leak in the village hall made it unavailable), said that “1) the solar park subsidy speculators should not to be trusted, listing a number of lies within their propaganda, and that 2) the two farmers, who attended the meeting, who have farmed and know the land better than anybody, say it is of high agricultural quality”. He added that “with the government and some 85% of the local community against the blighting of good agricultural land that is a green lung between the encroaching Rugby and Lutterworth, with an inefficient and costly industrial solar park, we are confidant the local planning committee will reject this proposal, if the speculators wish to waste more of their money and everybody’s time by submitting an application”. The Government's Energy Minister has pledged recently that solar parks must not become the “new onshore windfarms” on greenfields and said he wanted solar panels installed on factory rooftops (and warehouses) instead. Also, in the first solar park appeal case since Eric Pickles’s tightening of government solar guidelines in March, Hive Energy’s proposal at Tattingstone, Suffolk was rejected. The Inspector Elizabeth Ord makes it clear that large-scale solar parks should focus on “previously developed and non-agricultural land”. The community around Wolvey came together on June 20th and voted overwhelmingly by 175 to 6 (97%) against a new gigantic wind turbine proposal between Wolvey and Monks Kirby. Over 200 people sent in their objections to the building of a wind monitoring MetMast at Wolvey Wolf and over 50 people again lobbied a second planning meeting on September 24th but councillors on the advice of Nathan Lowde, the planning officer, accepted the application for three years on a majority vote. The argument was made that an Inspector on appeal would approve the Metmast even though it was in the GreenBelt and this would cost the Council money. Click here to visit the Wolvey Wolf page on this website and see a map where the turbines are proposed. 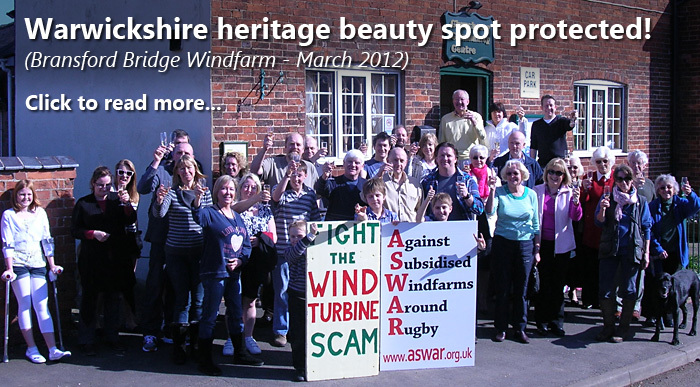 ASWAR is hosting this website page for WASTE to help publicise their campaign to defend another community 'around Rugby' from wind turbine speculators. We thank the Rugby planning committee councillors, who discussed adding extra reasons for refusal and decided this was unecessary with the Officer stating there was no mitigation available to the NATS Aviation Safety objection, gave a unanimous vote to refuse, with two Lib Dem and one Labour councillor abstaining. It has only now come to light that McAlpine/RES have known since 2012 that NATS (UK's air traffic control body) would object and their lawyers should have been aware that RBC would be legally required to refuse their application. ASWAR asks why have these speculative developers kept the local community under threat for two years? Has somebody been trying to cover-up their earlier mistake of buying the landowner contracts off SSE? McAlpines should now do the decent thing and announce that they are immediately withdrawing and will not return, letting the community get on with its life in peace. Lorne Smith, ASWAR’s coordinator added that “McAlpine/RES have repeatedly propagandised their wind turbines in economic terms but people with commonsense, who may although like the concept of renewables, know that the primary purpose of wind turbines and solar farms is to generate money for land owners, overseas manufacturers and development speculators at the expense of the public and increased fuel poverty, at which they are very efficient. The communities around Churchover and Cotesbach are under seige again. To read ASWAR's initial (12 page) response to the new application CLICK HERE. 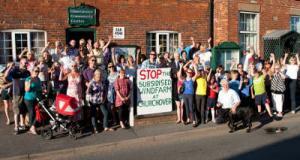 To read Churchover Parish Council's (34 page) objection CLICK HERE. There is no rational energy or economic reason in favour of these wind turbines that steal some 15% of everybody’s bills and stuff the subsidies into the pockets of speculators and rent-seeking landowners - 10% (33% by 2020) in green taxes plus a proportion of the new infra-structure cost of linking turbines to the grid. But actually the intermittency of wind makes it necessary to have fossil-fuel back-up spinning the whole time for the National Grid to maintain an even voltage; (electricity cannot be stored) therefore wind turbines don’t even save CO2 anyway. (also the scientists say that GW has not increased since 1997 - seventeen years of stand-still). (America is receiving increased manufacturing investment because it has reduced its energy costs and CO2 emissions through its safe, clean, Shale Gas fracking policy). The community around Churchover/Cotesbach turned out in force to show their dislike at being victims of the windfarm scam for a second time. With each windfarm job in the UK being subsidised by £100,000 from our electricity bills, and 10 McAlpine/RES staff supporting their propaganda exhibition, there was £1 million of our money walking around Churchover today! Government Ministers and the local MP have promised that local communities need to give their consent before windfarms can be built, so ASWAR held a Community Meeting on Wednesday July 10th in Churchover Village Hall to discuss and vote on the new windfarm proposal. At the meeting, where there was a unanimous vote against the windfarm proposal, Lorne thanked Leigh Hunt and Philip Morris-Jones, their elected Borough and County Councillors for their support and the many from other local villages, as well as James Delingpole, fresh from his spirited performance on BBC’s Any Questions programme, who gave the meeting a preview of ‘the diabolically expensive’ way the government will attempt to keep the lights on when the wind does not blow, given in his Mail on Sunday article published July 14th. Dr Chris Down, the professional local planning consultant, noted that four out of five reasons used by the Rugby planning Committee to reject the SSE wind turbines apply to the new four turbine proposal, while the accumulation of other windfarms, that have recently appeared across the nearby landscape, further strengthen the reason for rejection. In summer 2010 a Scottish developer gave a week’s notice of an exhibition to announce their 15 turbine wind power station proposal. With half a day’s notice, the community of Churchover had reacted with a Mass Picket. See photo on the right. The Parish Council, wanting a true test of the Parish’s opinion, organised a listening event for people to confidentially log their view. Well over 90% were against. A campaign launch meeting was held in the packed village hall at the end of September ( Click here to see the Press report ) when there was a unanimous vote to set up an Action Group to defend the community. A second propaganda exhibition by the developer for a 9 turbine proposal was mass picketted in October with many people coming from nearby villages. click here to read the Press report. A Rally on the steps of Rugby town Hall was held on a cold january's evening to emphasise to Councillors that over 90% of the community expected them to reject the proposal. See photo on the left. The developer's proposal was for 9 wind turbines each linked by a 6 metre concrete track across the valley behind Churchover. At 126 metres tall, they will be 5 times the height of the village church. The nearest will be about 700 metres from the officially designated village conservation area and some 430 metres from some houses. Will your house value be reduced? Read more.. It is a good investment in time and money to help the fight. Do you want one of the Midland's iconic views of a conservation village with its 9th century historic church that presently dominates the meandering Swift Valley to be blighted and vandalised? Are the health hazards of Turbine noise (audio and infra-sound) being brushed under the table? If the Churchover windfarm goes ahead, it will be the first of many across the rural Rugby area and being in a beautiful area and so close to housing, no area will be protected in the future. Help stop a precedent being created. A wind energy policy stands no chance of altering atmospheric CO2 concentrations, still less of deflecting climate change. Read more..
“saving the environment” by building wind power stations that damage the environment, is NOT a good idea!